What kind of damp is it? There are a lot of different issues that could cause damp problems in your house. Here is a useful article to help you determine what kind of damp it is………. “Find out what type of damp is affecting your home so that you can eradicate the problem without spending more than you need to. Each needs to be treated in different ways, and damp repair costs can vary dramatically, so it’s important to know what type of damp is affecting your home before you try to get it fixed. 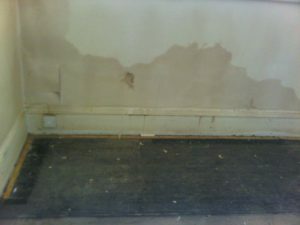 Our image gallery below will help you to identify the type of damp or mould you are dealing with. Scroll down to find out what could be causing it, and find out how to treat and prevent it. The worse the situation gets, the more it’s likely to cost to remove and repair any damage – read our guide to find out how much it costs to get rid of damp for more information. Condensation is the most common kind of damp. It is caused by moist air condensing on walls, particularly in rooms with a lot of air moisture, such as kitchens and bathrooms. It’s mainly, but not always, a winter problem, as at this time of year walls are much colder than the air inside. Condensation can be exacerbated by poor ventilation and heating that comes on and off, as this allows warm, damp air to condense. The removal of existing chimneys and energy-saving measures, such as fitting air-tight double glazing, can reduce ventilation. This problem can be particularly apparent in old homes that were built to ‘breathe’ and allow dampness to evaporate out of the home, while modern homes are built to keep water out in the first place. There are systems available to help improve ventilation – read our first look review of the Drimaster Heat positive input ventilation system to see if it could help. You can also use smaller dehumidifiers to cure damp issues. You may notice water droplets on windows or walls, see dark mould appearing, particularly on glass or around windows, and/or notice an unpleasant smell. If left untreated, condensation can damage paint and plaster and cause window frames to decay, so when you see it form you should wipe it away with a cloth. Alternatively, if you prefer to use less elbow grease, some gadgets claim to be able to help with condensation and leave your windows streak-free – find out what happened when we tried out the Karcher window vac. If your home is suffering from condensation, take a look at our in-depth expert advice on the best ways of dealing with condensation. Rising damp is caused by ground water moving up through a wall or floor. Most walls and floors allow some water in, but it’s usually stopped from causing damage by a barrier called a damp-proof course or damp-proof membrane (see image on website). A damp-proof course is a horizontal strip, usually made from plastic or bitumen felt, built into the wall at the height of at least 15cm above ground level. A damp-proof membrane is a sheet of material, impervious to water, laid under the concrete floor. This should be connected to the damp-proof course so that the house is effectively sealed and protected from ground water. Newer houses will have both, as they are a requirement of building regulations (Part C for England and Wales), but older buildings (particularly those built before regulations came into force in 1875) may not, or they may have worn or been damaged over time. If this is the case, your walls or floor may suffer from rising damp. Rising damp can also happen when there’s a lack of drainage, or the level of the ground outside your home is higher than your damp-proof course, allowing water to get above it. If you have rising damp, you may notice damaged skirting boards or plaster, as well as peeling paint and wallpaper, often with wet patches. Rising damp may dissolve soluble salts from the ground and building materials, which can then crystallise, forming a white, powder-like substance. This, along with the water, can leave tide marks along the wall. If the problem is coming up from the floor, you may notice floor coverings lifting, or damp patches. Read our guide to find out how to treat issues with rising damp, and whether you need to call in a professional to deal with it. If you do, our damp-proofing costs page will give you an idea of how much you need to spend. Penetrating damp is caused by water leaking through walls. This type of damp may expand across your walls or ceiling, but this will move horizontally, rather than by travelling up walls (as is the case with rising damp). Penetrating damp is usually caused by structural problems in a building, such as faulty guttering or roofing, or cracks in the walls, which mean walls or roofs are regularly soaked with water. It can also be caused by internal leaks, such as pipes under the sink or bath. Damp Proofing Cape Town - Damp Specialists in Cape Town. We are specialists in all aspects of damp proofing and offer dampproofing advice and viable solutions to damp and mold problems to our clients. Contact us for a thorough Damp Assessment.